Red State Talk Radio Announcement (Philadelphia, PA), March 01, 2017 – Red State Talk Radio (RSTR), “America’s Talk Radio Station” is honored to announce that we have once again been rated the #1 Digital Conservative Talk Radio Station in America by Top Talk Radio for 2016. This marks the 5th consecutive year RSTR has been ranked #1 in the country. We would like to take this moment to thank our listeners who have helped us achieve this accolade. Over the past year Red State Talk Radio has surpassed many milestones with 24.4K Tunein followers, over 20K Roku subscribers, over 20K mobile app users, and an Alexa website traffic rating unmatched in our industry. We’ve introduced our listeners to the most daily LIVE programming in America with over 30 LIVE hours of daily. 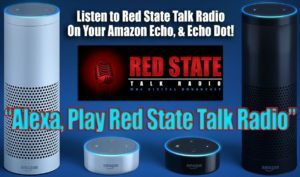 Red State Talk Radio has partnered with Liberty Alliance and The Horn News to bring RSTR live talk radio to new audiences, and has introduced Voice Command On-Demand Radio features with the Amazon Echo simply by saying “Alexa, Play Red State Talk Radio”. Soon we’ll be engaging all RSTR listeners with centralized call-in that will be accessible to all of our live programming. We are excited about the emergence of digital radio, and the voice command on-demand listening option in your car, and your home. At Red State Talk Radio our future is bright, and we owe it all to you, our listeners. For feedback, question, and suggestions please feel free to email feedback@redstatetalkradio.com.